In today's marketplace, leveraging technology and cloud-based solutions to automate data processing and other low-value work is essential to running an efficient and profitable CPA practice. Given the pace of change, it’s also too easy to feel overwhelmed by the abundance of choices and make bad decisions that cost you time and money. 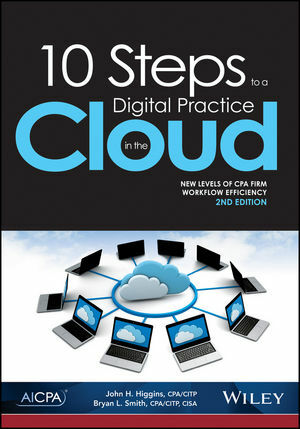 10 Steps to a Digital Practice in the Cloud will help you clear a path for your firm’s success. Authors John Higgins and Bryan Smith guide you through each step, helping you implement best practices in each area, select the right solutions for your firm, and better serve your clients. They also include several real-world CPA firm case studies to illustrate how other firms have saved time and money while making their firms run more efficiently by moving to a digital practice model. This second edition is updated to reflect the current state of the market and the technology solutions available for cloud-based server infrastructure, personal computers and software, mobile computing, scanning, client portals, document management, workflow, cloud accounting and more. Use it to develop your technology plan and make a valuable investment in your firm’s future. John H. Higgins, CPA/CTIP, is the co-founder of CPA Crossings, LLC, which specializes in helping accounting, tax, and financial professionals to leverage technology. John recently created the Cloud Accounting Learning Center to help CPAs leverage the new cloud accounting paradigm. Bryan L. Smith, CPA/CTIP, CISA, serves as a virtual CIO to CPA firms and professional organizations. As a co-founder of CPA Crossings, Bryan specializes in helping CPAs to optimize the use of Excel through the new Excelerator Learning Center.